ACG Multi-Tool Deluxe Belt Pouch. 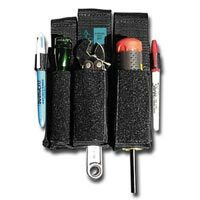 Popular compact pouch made of super durable nylon webbing designed to carry a multi-tool, mini flashlight, crescent wrench and Sharpies. Features: Closing flap to keep tools in the pouch, capacity to hold a 6", 8" or 10" crescent wrench. Screwdriver side pocket. Accomodates The Scorpion or Surefire Flashlight. Dimensions: 6" L x 6" W x 1.5" D.